I know the trend is to go green and save the environment. Look’s like the trend is catching on in the hunting world. Check out this press release we received today about an environmentally friendly electric vehicle fit for the outdoors. With the Zombie invasion upon us – I guess it’s better to go green…. Check it out and let us know what you think. 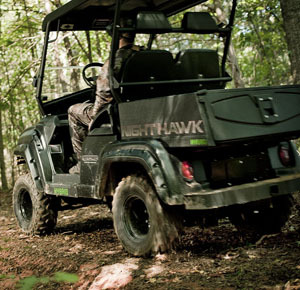 Enjoy a longer, worry-free hunt with the new 72-volt Stealth Night Hawk Hybrid, the most innovative, multi-functional vehicle ever designed and manufactured in the US. Thanks to the Night Hawk Hybrid’s Auxiliary Power Unit (APU), you get up to 80 miles on a full eight-hour charge and three gallons of gas. The APU creates and supplies current and has been customized for the Stealth Hybrid. With this type of long-lasting power, you can hunt with confidence all day long. Unlike other hybrids, which are powered by a dual gas combustion engine and electric motor, the Night Hawk Hybrid’s APU is much quieter and has fewer parts to break. With a 30 horsepower electric motor, 130 ft. lbs. of peak torque and an insulated and muffled motor, the Night Hawk Hybrid gets you there quietly, quickly and without fuss. Now your range is limited only by the amount of fuel you carry. The newly designed cockpit interior styling combines cutting-edge style with convenience and function. The versatile Stealth exclusive cargo bed has a configuration to handle any task, from carrying your next trophy out of the woods to carrying your friends to their next hunting spot. It also includes a dump feature. 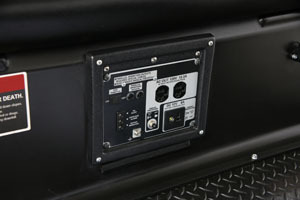 The Portable Power Station offers you the ability to run 120 volt for power tools or 12 volt for accessories. 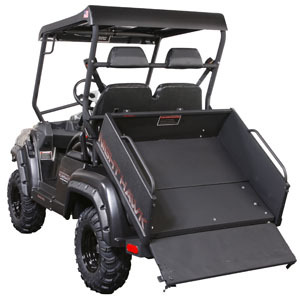 Other features include a wet cell battery system, dash-mounted battery fuel gauge, 700 AMP controller, -13 degree F to 135 degree F operating range, an onboard 13 AMP charger/maintainer, and a forward- and reverse-switching system. Join Stealth Revolution. Don’t get left behind. Check out www.stealth4x4.com for more info. This entry was posted in Hunting and tagged electric atv, hybrid atv, multi functional atv, stealth night hawk hybrid. Bookmark the permalink.